The band and their trusty steed (a.k.a. the van), which clocks an average of 250 miles a day. Kemmerer, Wyoming, is the sort of middle-of-nowhere small town that doesn’t see many visitors. The closest major city is Salt Lake, two hours away, and its only claim to semi-fame is the J.C. Penney Mother Store, circa 1902. 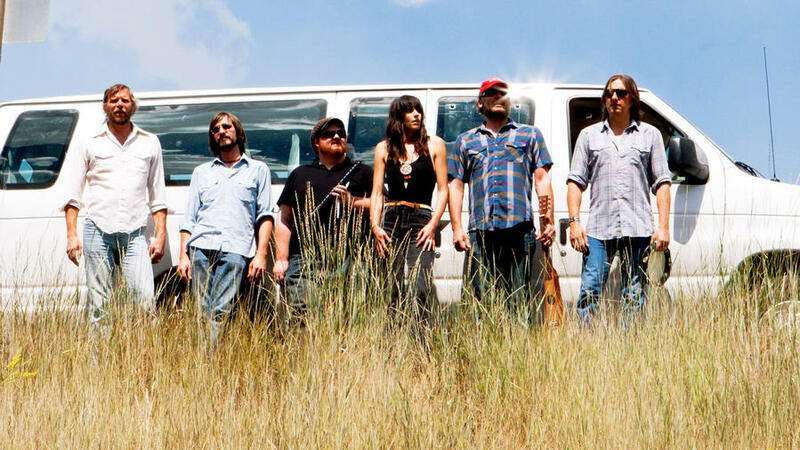 But for Nicki Bluhm & The Gramblers, Kemmerer is a must-stop—one of 117 on last year’s tour, that had this rising country-rock band crisscrossing the country, ultimately logging a whopping 57,000 miles. Home is technically San Francisco, but, really, this one-woman-five-man band lives in the van, in musty motels, at greasy diners. At the whims of the saloons, clubs, and festivals that book them, their routes are often illogical and backtracking is frequent. In summer 2012, they passed through Idaho Falls, Idaho three times in one month. Which is to say, this talented group understands what a road trip is all about: the off-the-beaten-path places—and what happens as you ramble between them. Nicki and her crew play music in backroad towns like Bond, Co, and Pocatello, ID. On this warm summer evening, they’ve hightailed-it 340 miles from Bond, Colorado to roll in right on time to headline Kemmerer’s annual Oyster Ridge Music Festival. The vibe is more ’70s than 21st century—and not just because Nicki looks (and sounds) like a dead-ringer for Karen Carpenter. The grassy square is filled with camping chairs and coolers and a motley crew of locals who quickly become friends—gray-haired men in overalls; toddlers bopping on shoulders; a scattering of twirling hippie-chicks; even a real-life Smokey the Bear, wearing the same Wrangler jeans as Nicki. All congregating for corn dogs and Coors and the sort of free Friday night fun every road-tripper hopes to just stumble upon. Except, the thing is, we don’t. In these time-crunched, overly efficient days, we’re too busy bee-lining from Yosemite to Yellowstone, Telluride to Santa Fe, to bother being carefree. The modern-day road trip has become more like a micro-managed death-march between big-name attractions, carefully choreographed to maximize a week’s worth of vacation time. Not so for Nicki and her Gramblers. They may not have time for a guided tour of the Tetons, but so what? They know where to find cold PBRs and warm waffles for breakfast at 10,000 feet. A steamy hidden hot springs off the highway. The best places for a pit stop. Their white rental van might as well be a wood-paneled station wagon, without the Are We There Yet? gripes and sibling squabbles and crackly 8-track radio. There’s no radio whatsoever, actually. None needed. Not with Tim on harmonica; Deren on mini-guitar; Mike banging on a drum; Dave clapping to the beat…and Nicki blowing your best car-karaoke efforts away, singing her heart out at 70 miles per hour. Nicki Bluhm & The Gramblers’ five million YouTube viewers of their wildly successful Van Sessions would agree: these guys just might be the last real road trippers. Watch their Hall & Oates cover and you’ll hear the hallmarks of the young band: their soft harmonies and shaggy confidence, Nicki’s voice, soulful, outward-reaching. But listen closer, just beneath the music, and you can hear something else, something more familiar. A low, steady hum. It’s the sound of the open road. “We’re kind of food snobs,” says Tim Bluhm, digging into a plate of braised short ribs, paired with pinot, at the Cascade Grill, in Jackson Hole, following a late afternoon performance in Teton Village. For once, the band is being fed—well. The night before, it was “the worst pizza I’ve ever had in my entire life,” as Tim put it in Pocatello, Idaho, as he tossed a piece of half-baked crust over his shoulder. And the morning before that: It was Café Ritz, in Kemmerer Wyoming. Puffing on his tenth cigarette of the morning, Bob, of Bob’s Rock Shop, warns us Café Ritz is expensive. But at six bucks for biscuits and gravy, it’s not the prices that are the problem. It’s the service. Apparently, when you’re the only place in town for pancakes, turning tables is not a priority. Finally, the harried waitress brings over seven mugs of burnt coffee and takes a pen from behind her ear. But then a baby cries. “Uh, be right back,” she says. “I’ve got my two-month-old in the kitchen.” When she returns 20 minutes later with a hot pot of coffee in one hand and, indeed, a newborn—neck dangling—in the other, Tim Bluhm up and bails on his yet-to-arrive waffle. Mike the drummer follows him out the door. “Tim calls it the Food Desert out here,” says his wife and bandleader, Nicki, digging into her scrambled eggs, which eventually arrive. Cold. “I think it’s the toast that took them so long,” says guitarist Dave Mulligan, holding up a flimsy piece of un-browned white bread. The band takes a break at a hidden swimming hole. Being on tour is like being on the anti-Grand Tour. Yellowstone is out. No time for a hike in Grand Teton National Park either. Instead, sightseeing is more happenchance, fun found en route. Like, say, in Kemmerer: “Look, it’s the JC Penney Mother Store!” says Nicki, snapping an Instagram pic of the circa 1902 store. “Let’s see if they sell swimsuits.” (In the heat of the summer, oddly, they don’t.) Instead she finds a hot-pink “Pretty Woman“-like number in Lava Hot Springs, an Idaho vacation town taken over by bikini-clad tourists toting inner tubes. The next day, the van creeps along Highway 20, as Tim hops in and out between mileage markers, hunting for this secret hot springs among the roadside brush. Finally, he finds it—not a soul in sight. And no bathing suits required. They clock thousands of miles a year driving from gig to gig. They might not have time for a hike in the Tetons, but the band knows where to find a secret roadside hot springs and the best waffles at 10,000 feet*. Here, Bluhm talks snacks, sing-alongs, and the hidden joys of two-lane travel. It’s not all McDonald’s all the time, is it? The band knows the pull-offs, swimming holes, gas stations, burger joints, and best songs to sing at 70 mph. We try and avoid fast food whenever we can. It’s hard, but Whole Foods are popping up everywhere now. We’ll swing by for the salad bar and to stock up on stuff like coconut water and raw almonds, which we like to keep in the van. Yelp is a huge lifesaver. We use it constantly. A place has to have four stars and at least 20 reviews or we won’t eat there. We’ve learned a thing or two from Anthony Bourdain: No sushi on Sundays or Mondays. And stay away from hollandaise sauce. So pass on the eggs Benedict at the diner. Best seat in the van? Oh, shotgun, for sure. Driver’s seat is not bad, if you feel like driving. But otherwise, front row is where you want to be. The way-back can be pretty bouncy. We don’t get attached to one seat, though. Most of us are actually pretty tall, so we try to switch around before the leg cramps start setting in. How long’s too long on the road? Everywhere in the West is so far apart. We probably drive an average of six hours a day. I’d say that’s a good clip. We once did Lake Tahoe to Austin, about 1,700 miles. We rotated drivers, drove through the night. We rolled in at 7 a.m. for the South by Southwest festival and had to play that night till 2 a.m. That was pretty rough. Catnaps. Coffee. We try to avoid those five-hour energy drinks. The guys play Frisbee at every gas station. I’ll do a few laps around the pumps, or jumping jacks. We went through a Words with Friends period, but one day we looked around at all of us staring at our phones, and we were like, ‘We’re such losers! Let’s talk.’ We rarely play the radio. If anyone listens to music, it’s usually with earphones. Eight people are never in the mood for the same music. The Gramblers playing an impromptu van session while on the road. Yeah, when we’re bored, we’ll grab our instruments from the trailer and just start playing. That’s basically how the Van Sessions began. We were on a long haul and our bass player busted out his ukulele and started playing “Tonight You Belong To Me” from the movie The Jerk. We strapped an iPhone to the rearview mirror, recorded it just for fun, and sent it out to a few friends. They loved it, so we kept doing it. The clips went viral and became a big hit. Our Hall & Oates cover of “I Can’t Go For That” has over 2.5 million YouTube views. It’s crazy. Are you loyal to a hotel chain? We’re not necessarily loyal to any particular chain. We’re on a budget and usually Priceline it, looking for the best rate, often right as we’re rolling into town. We’ll only search three stars and up and find some great deals. I like anywhere that has Paul Mitchell shampoo and conditioner. That “conditioning shampoo” stuff drives me nuts. If we can afford it, the Marriott is the best because the beds have duvet covers. If there’s a duvet cover, I’m stoked. You never know if a bedspread’s been washed. Big Sur is amazing. We just did a gig there where we got to perform at the Henry Miller Memorial Library. Such a magical place. Maybe 350 people, tops. We played this amphitheater surrounded by redwoods, right under the stars. It doesn’t get much better than that. What’s your all-time favorite stretch of road? Tough one. Highway 50 in Nevada is incredible in spots, but I guess I’d have to say Highway 120 through Yosemite and Tioga Pass. It’s so rugged and vast, with fun stops. You eat at the famous Mobil station in Lee Vining, stop for a dip in Tenaya Lake. So peaceful. But the best road is always the one home. *Where to find those waffles? At Corbet’s Cabin in Jackson, WY, just a tram ride from Teton Village to the summit. The hot springs? Sorry, those, they say, will remain a secret. To check out Nicki Bluhm & The Grambers’ tour schedule, go to nickibluhm.com.